Schwartz & Wade, 9781524765309, 40pp. Laugh along with a dog named Douglas and his pal Nancy in this silly follow-up to Douglas, You Need Glasses! as the friends execute outrageous plans to meet their neighbors. Pals Nancy and Douglas think their baseball game is over after their ball rolls through a hole in the fence. But when the ball rolls back, followed by a note in an unfamiliar language, they have to discover who's on the other side of the fence. And so in a series of truly outrageous--and hilarious--stunts, Nancy tries to launch, vault, and fly Douglas over to the other side to see what's what. Finally, after all Nancy's plans fail, Douglas gets his turn to execute a plan--and it works! And who do they find? New friends who speak Spanish. Readers will laugh out loud at the antics in this zany picture book, which proves that working together makes everything more fun. 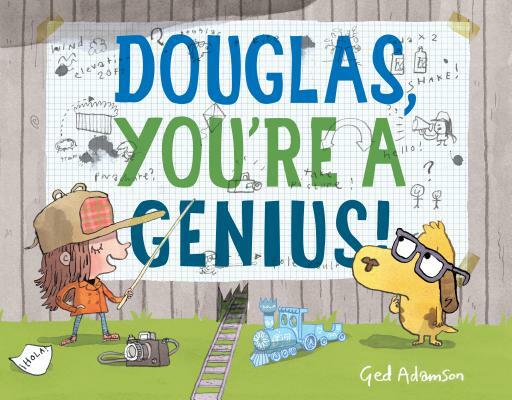 GED ADAMSON is the author and illustrator of Douglas, You Need Glasses! ;I Want to Grow; and most recently, Shark Dog! He has worked as a cartoonist, a storyboard artist, and a music composer. It was always his ambition to write and illustrate picture books. Ged lives in London with his family. Learn more at gedadamson.com and follow him on Twitter at @ged_adamson.